Patti Boyd must have been very flattered when she had three songs written about her. The leggy blonde, who has just turned 70, was a model who was married to both George Harrison and Eric Clapton. George, who met her on the set of A Hard Day’s Night, wrote the Beatles hit Something for her whilst Eric wrote Layla and Wonderful Tonight. There is another lady who had three American hit single written about her and her name is Renee Fladen. 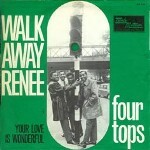 In the UK, the Four Tops had the massive hit peaking at number three hit in January 1968, but the song was recorded a year earlier by The Left Banke. A session violinist called Harry Lookofsky owned a small storefront recording studio in New York City that he called World United Studios. One night in 1965 he gave a set of keys to his 16-year-old son, Mike Brown who helped out by cleaning up and occasionally sitting in as a session pianist. Mike began bringing in his friends who tinkered with drums, guitars, amplifiers, the Steinway piano, and anything else they might find. Except for Mike, who had a background in classical piano, none of them were top musicians. But they could sing, especially one guy named Steve Martin. 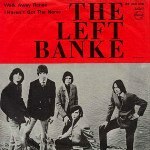 By 1966 they started to call themselves the Left Banke and Steve became their lead singer. In addition to Mike and Steve, the group included Rick Brand on lead guitar, Tom Finn on bass and drummer George Cameron. Finn brought his girlfriend to the studio one day when the group had assembled for a practice session. She was a 5’6″ teenager with platinum blonde hair. Mike Brown was infatuated with her the instant he saw her. Although there was never anything between the two, but Mike was fascinated by her and pictured himself standing at the corner of Hampton and Falmouth Avenues in Brooklyn with Renee, beneath the One Way sign. In his fantasy, he was telling her to walk away. Mike, whose real name was Michael Lookofsky, was just 16 and had only known Renee a month when he decided to write the song with his two friends Tony Sansone and Bob Calilli. Incidentally, the other two songs written about her were also recorded by the Left Banke and were the follow up Pretty Ballerina and She May Call you up tonight. Renee used to turn up quite regularly at the recording studio Michael recalled, “My hands were shaking when I tried to play, because she was right there in the control room. There was no way I could do it with her around, so I came back and did it later.” They never became an item and Michael decided that he was better off with her out of his life. The idea of using a girl’s name in the title was inspired by The Beatles Michelle and the idea for the flute solo came from The Mamas & the Papas’ California Dreamin’ which had been recorded six months earlier. Years later the song’s co-writer Tony Sansone gave a different version of the origin of the song. He stated in interviews that he wrote the lyrics for the song, and that he randomly chose the name Renee because the Beatles used the name Michelle in their hit song of the same name, and so he did likewise, choosing the French name Renee as the female object for the song. At least they both agreed on one thing. Once the song was recorded, they had trouble finding a record company who were interested. Mike’s father Harry took the song to 10 different record companies before Smash Records picked it up. It entered the Billboard charts in 1966 and remained there for ten weeks, peaking at number five. As for Renee, she moved to Boston with her family shortly after the Left Banke recorded Walk Away Renee, and no one in the group ever saw her again. But in 2000 it was discovered that she was a noted singer, vocal teacher and artist now living on the West Coast of America.